Next in the series on Golden Valley Meat Snacks is this Black Pepper variety. See my previous reviews of their Original and Original Ripple Cut varieties. 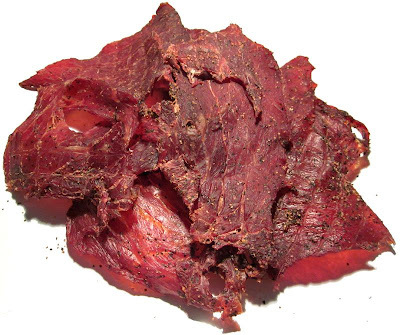 Golden Valley Meat Snacks is a new line of jerky from Intermountain Natural, LLC based out of Idaho Falls, ID. 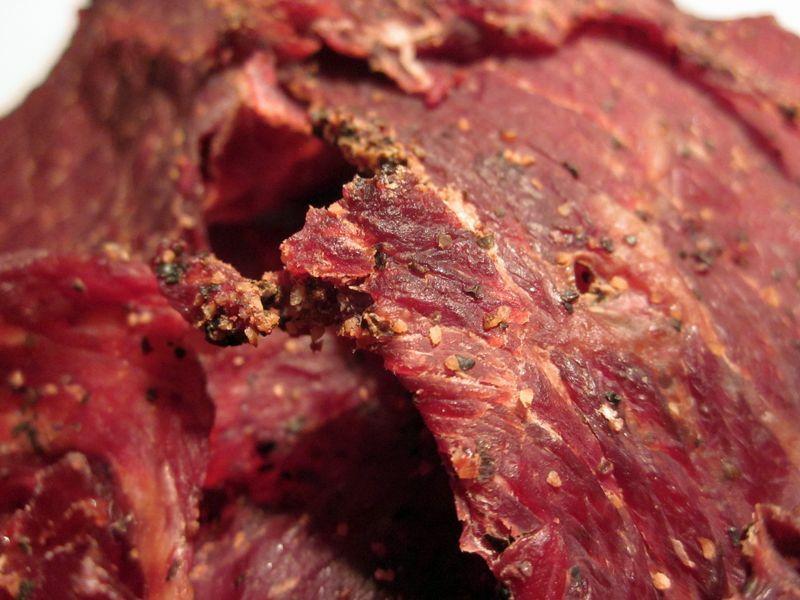 They also make the Golden Valley Natural line of jerky, and are a major private labeler of jerky for stores like Trader Joe's and Whole Foods Market. This line of jerky is not a natural or organic jerky like their Golden Valley Natural line, but appears targeted to compete against national brands like Jack Link's and Oberto. Beef, water, corn syrup solids, salt, flavorings, dextrose, sugar, monosodium glutamate, smoke flavoring, sodium ascorbate, sodium nitrite, butter buds (maltodextrin, butter, buttermilk powder). The first thing I taste from the surface of these pieces is a moderate saltiness. A light bit of black pepper is also noticeable. The chewing flavor starts with an increased saltiness and an increased black pepper. There's a touch of sweet that I can pick up back there. 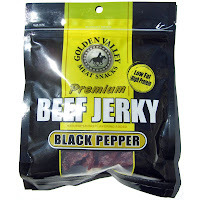 For being labeled as "Black Pepper", this jerky does have a well-noticeable black pepper flavor, more so than in this brand's Original variety. It's easily noticeable in each piece, and then builds up a strong aftertaste throughout several pieces. It's a strong flavor, but not excessive. But like the Original, it's still the saltiness that seems to provide the primary flavor. The saltiness is what sits in the center of my mouth while the black pepper stays in the back. The touch of sweet is ever so light, but I can pick it up in the chewing. There are no natural meat flavors that I can detect, and I don't really pick up any of the smoke flavoring. Overall, what you're going to notice in this is primarily a saltiness, with a good deal of black pepper flavor in the back of your mouth. This is a dry jerky with mostly a dry surface feel, except for maybe a thin coating of oil. These pieces have that soft rubbery consistency that allows them to bend a full 180 degrees on themselves without cracking apart. Biting off chunks requires some tearing and a little bit of gnawing, while chewing seems overall easy. I didn't encounter any pieces with fat, and no streaks of gristle or tendon. There's a little bit of stringiness, but nothing resulting in an unchewable wad of tissue. It's somewhat clean eating with my fingers picking up a fine coating of oil, but not requiring a finger licking. Tearing pieces apart, however, throws a fair amount of black pepper bits on my lap. Intermountain Natural sells this Black Pepper variety from their website at a price of $6.49 for a 3.25oz package. Shipping is at $5.00. If you bought 5 packages, it would total up to $37.45. That works out to a price of $2.30 per ounce. For general jerky snacking purposes, at the same $2.30 per ounce price, it seems to present a fair value. I'm getting an average level of snackability for an overall satisfactory flavor, a decent meat consistency and average chewing texture. That price is a little higher than the major brands found in the grocery stores, and yet seems to provide a comparable snackability. As a Black Pepper beef jerky, at the same $2.30 per ounce price, it's a decent value. I'm getting a good deal of black pepper flavor in an overall satisfying flavor and meat consistency. 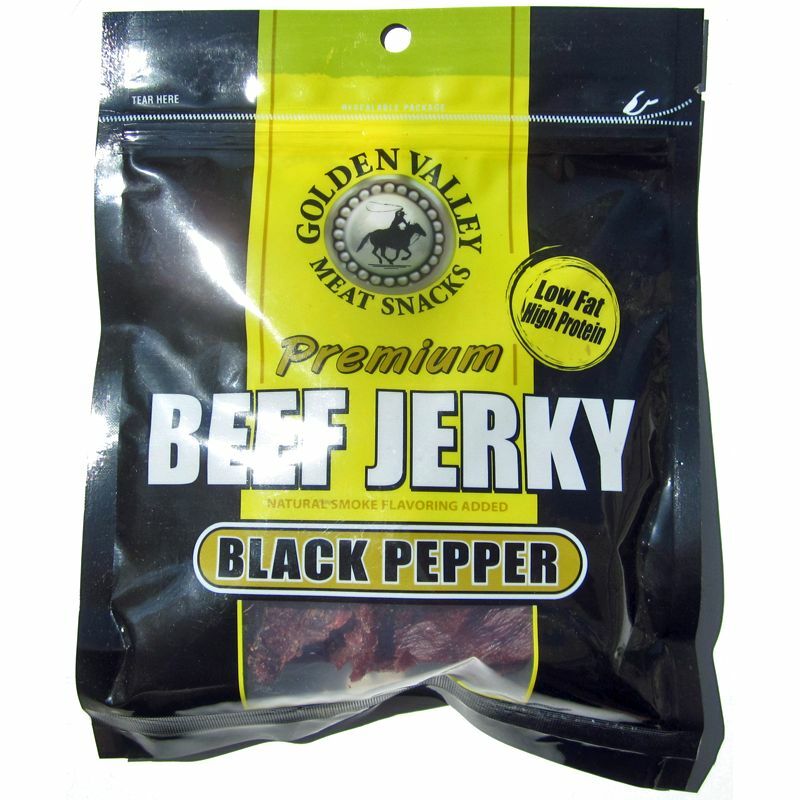 This Black Pepper beef jerky from Golden Valley Meat Snacks dishes out a good deal of black pepper flavor with largely just a salty flavor being the dominant taste. This actually seems very comparable to this brand's Original variety, except with more black pepper. And in fact, I manage to find a fair amount of snackability due to that extra black pepper seasoning. For a thin sliced, dry, slab style jerky, this manages to retain a chewy quality that you'd expect jerky to have, yet is not tough and still has a meaty chewing texture. It's flavor is still not exciting, and nothing above average, but in comparison to all the other brands I've reviewed, it's not bad, and seems to sit in the middle of the ballpark. My recommended beer pairing for this, go with a malty pale ale to help counter the peppery bite. Try the Firestone Double Barrel Ale, or the Widmer Drifter Pale Ale.